Fond of Snape » Blog Archive » Alone but not lonely with my Nook! Ahhhh…I haven’t given into the temptation to even look at a Nook or Kindle…Not going there!!! People love them. I’ve never seen one with a cover like that though–yours is great. I love your Nook cover! I have a Kindle — the gratification of getting a book instantly is great! That IS a lovely cover! Don’t forget that a certain someone’s books are also available for your Nook… I’m just mentioning that in passing… No pressure or guilt or anything. Nope. None of that. Read in good health, my friend. That cover has my katydidnot right smack on front of it. No wonder it is so lovable! Wow I love the look of your Nook! Tempting to investigate if I “need” one – but I think I need to focus on some other stuff first – but hmm maybe after the summer as a birthday gift to myself. I would be afraid to take my Nook to the beach anyway…. 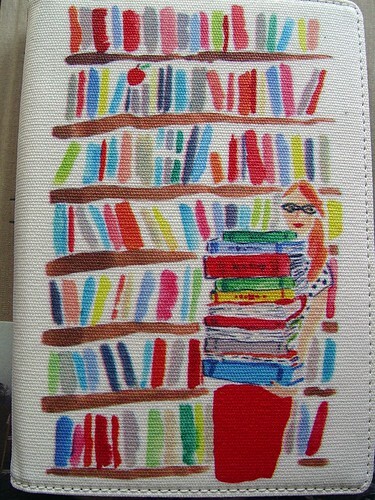 I might have to investigate getting a Nook, simply based on that wonderful cover! Several people in my book club have Kindles and were trying to talk me into one, but I’m not quite ready to give up the feel of paper in my hand… yet. That’s awesome – some people have them at work and they swear by them! Cool, I didn’t even know they come with a cover. I’m still waiting for the prices on those e-reader thingies to drop, because right now I can’t justify spending that much on my reading (certainly not with a Mt. TBR of ridiculous proportions). But as soon as I can afford one I’d love to have one. Are Nooks less expensive than the kindle? Because all I asked for this Xmas was a kindle and I didn’t get one. I have to check this out. I adore that cover. I’ve been thinking of getting a Kindle for awhile but will look into the Nook. What a great treat. love the cover! i don’t have an e-book reader and been having an internal battle with this idea. i know they’re environmentally friendly…but i still love holding and breathing in a good book. i’ll probably come around soon. this post is pretty persuasive for me. hee hee! thanks for sharing pics of your nook! i, too, love the cover! glad i could be of service. Ooh, so pretty! I have considered a Kindle but not sure how much I’d miss the “paper” of a book. How do you like it so far? I just had to laugh when I read the story of how you got your Nook! What a hoot. I have a Kindle and have been mostly fond of it, but am somewhat frustrated by the lack of an organizational system on it–all the books are just lumped together in one big list, and whatever you’ve just read is at the top… I would love to compartmentalized them into fiction and non-fiction, read and to-be-read, etc…. Does the Nook do that? Are you just loving it? Happy reading. 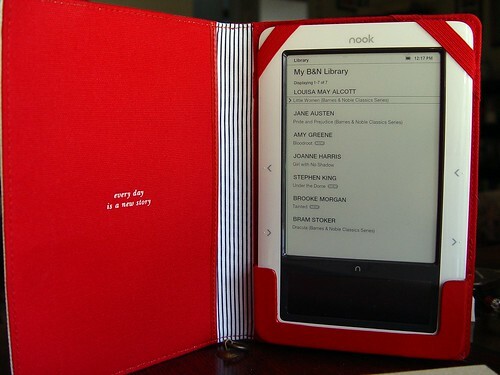 I hadn’t heard of a Nook before, but think I like the name better than a “Kindle”. I still don’t know if I can ever warm to one of these readers, though –but your’s is pretty and the cover is great! I have the “The Girl With No Shadow” in my bookpile(of books to read), too.